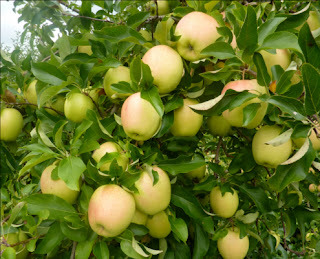 There is suspense because our apple tree is growing apples for the first time in forever. There was one year it had apples and that was years ago! This year the apples are there and they are getting bigger and we are holding our breaths. It is like a difficult birth. You do not want to smoke or drink or do anything that could possibly jeopardize these apples. The garage is falling down but the work is being put off so the apple tree will not be disturbed. I am thinking I should go outside with a boom box and play the apples Leonard Pennario playing Mozart. I want to give them the best of everything. These are Goldman Delicious apples. Did I say Goldman Delicious? I meant Golden Delicious. Those are not the apples up above! That is a picture I took off the Internet. I do not want to take pictures of our baby apples. What if it was bad for them? A prayer for our apple tree.